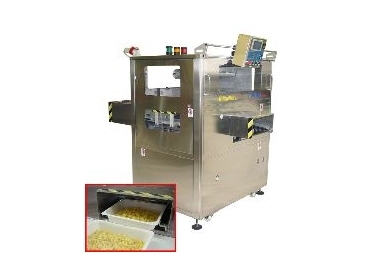 Sealing machine for pre-formed trays. DESIGNED for fast, flexible and reliable packaging, Twin is an automatic sealing machine from RotoPack SRL that will enhance the packaging process. Available from Heat and Control , Twin is an advanced automatic sealing machine for pre-formed trays featuring both vacuum and modified atmosphere. With bowl feeding from two conveyor belts, it is ideal for any type of packaging. Twin is economical and will save money on labour costs. Enabling simultaneous packaging of two half gastro-size bowls (320x265mm) at a production rate of 500 bowls an hour or four quarter-size bowls (265x160mm) at a production rate of 1000 bowls an hour, Twin is the fast solution that will fulfill all sealing needs. Twin can work with single feeding belts, double feeding belts or according to production requirements, meaning that it is available for use by anyone in the industry. Equipped with an inner vacuum pump as well as tanks for gas and compressed air, Twin provides efficient and effective operation. The machine is controlled by PLC with touch screen which allows up to 10 different programs and the display of machine diagnostics.